This calf was found on Sept. 14 with a significant part of her hind quarters chewed off, likely due to another wolf attack. Another five calves have been attacked by wolves at the Diamond M Ranch in Eastern Washington, bringing wolf-livestock conflicts to a tally of 15 in a short three-month period. 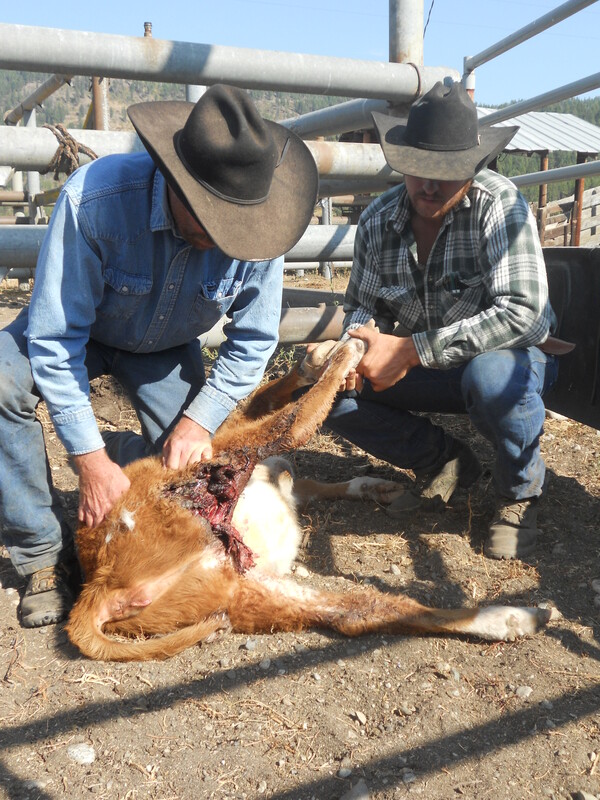 Three calves were found dead last week and two more suffered severe injuries, according to ranch co-owner Bill McIrvin. The two calves that survived were discovered on Sept. 12 and 14. Both had suffered severe bites and torn flesh to their hindquarters. One of the calves had parts of her reproductive and urinary track torn from her body so she can no longer urinate properly. The Diamond M, located in a portion of Eastern Washington known as the “Wedge”, has been working with the Washington State Department of Fish and Wildlife (WDFW) for several months to implement non-lethal methods to prevent damage to their cattle herd. Abiding with agency recommendations, the Diamond M waited to turn their calves out on summer range until they were 200 pounds. The ranch also employed more cowboys to patrol their grazing range. Despite these efforts, attacks to the herd have persisted resulting in a state confirmation of 10 dead and five injured since June. The McIrvin’s herd records suggest there are likely a total of 40 dead from wolf attacks. The WDFW recently dispatched personnel to try and “incrementally” remove a few of the problem wolves in late August, but deemed the radio-collared Alpha male and a breeding female off-limits. The restrictions are due to the fact the Gray Wolf is still listed as an endangered species in the State of Washington. The classification was imposed by the Washington State Fish and Wildlife Commission in 1980. Last winter the Commission passed the Gray Wolf Conservation and Management plan that outlines recovery objectives for the animal. As the Commission is trying to reach these objectives, some problem wolves are being spared. Despite nearly 20 days of pursuit by WDFW on the “Wedge” wolf pack, the Department efforts have not brought an end to the aggressive wolf pack behavior. The McIrvins feel this is due to a lackluster effort on the part of WDFW, who has sent out teams with no wolf hunting experience and insufficient equipment. McIrvin also noted that a study in the wolf plan described positive outcomes when the public was involved in the wolf control process. However, McIrvin noted that taking out one or two wolves will likely not solve his conflicts with the predator. The state Wolf Conservation and Management plan currently divides the states into three sections: Eastern Washington, the North Cascades and the Southern Cascades and Northwestern Coast. There are currently nine wolf packs in the Eastern Washington section, three in the North Cascades and none in the Southern Cascades/Northwestern coast. 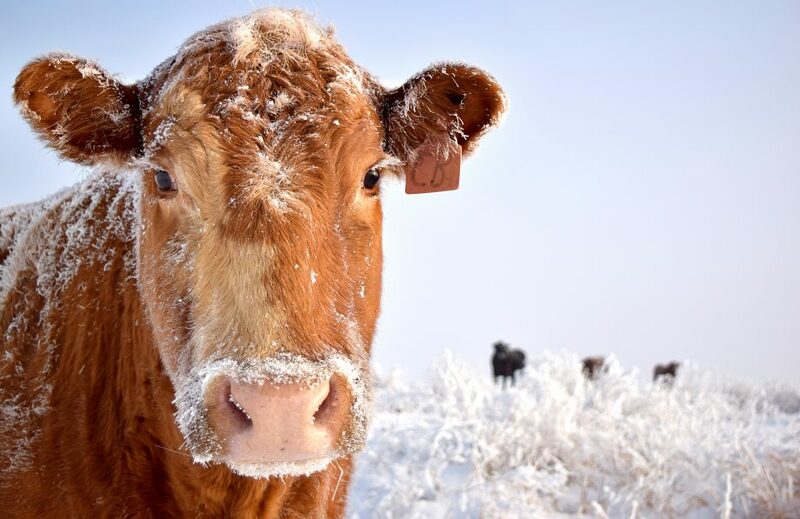 Stevens County Cattlemen’s Association President Scott Nielsen agreed.